Hot Water Systems: Adelaide, Brisbane, Canberra, Darwin, Melbourne, Perth, Sydney, Wollongong, Queanbeyan. 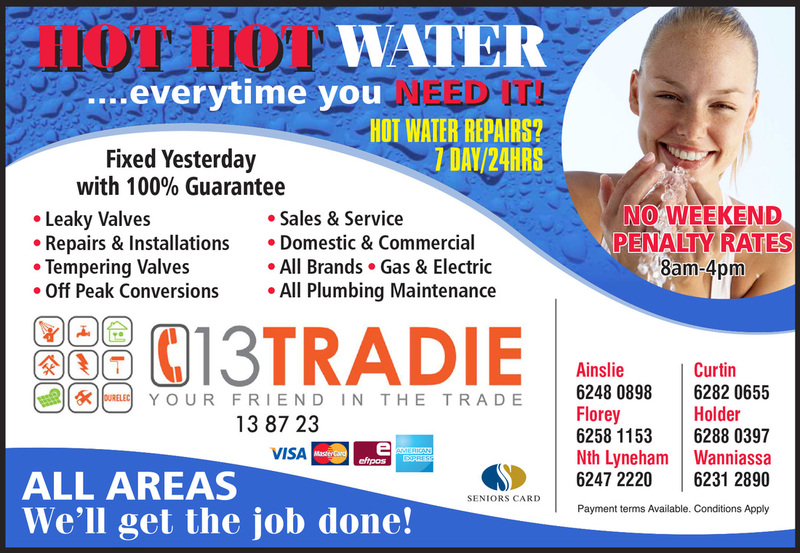 Yellow Pages Advertisement Canberra Directory Hot Water 2015 - Hot Hot Water...everytime you Need it! Hot Water Repairs 7days/24hrs. Fixed Yesterday with a 100% guarantee - No Weekend Penalty rates 8am to 4pm. -leaky valves - sales and service - repairs and installations - domestic and commercial - tempering valves - all brands - gas and electric - off peak conversions - all plumbing maintenance. Durelec Plumbers and Electricians. Visa Card, Master Card, EFTPOS and American Express. Seniors Card. Payment terms available conditions apply. All areas - Adelaide, Brisbane, Canberra, Darwin, Melbourne, Perth, Sydney, Wollongong, Queanbeyan. Call 13TRADIE - We'll Get the Job Done!